Hello! 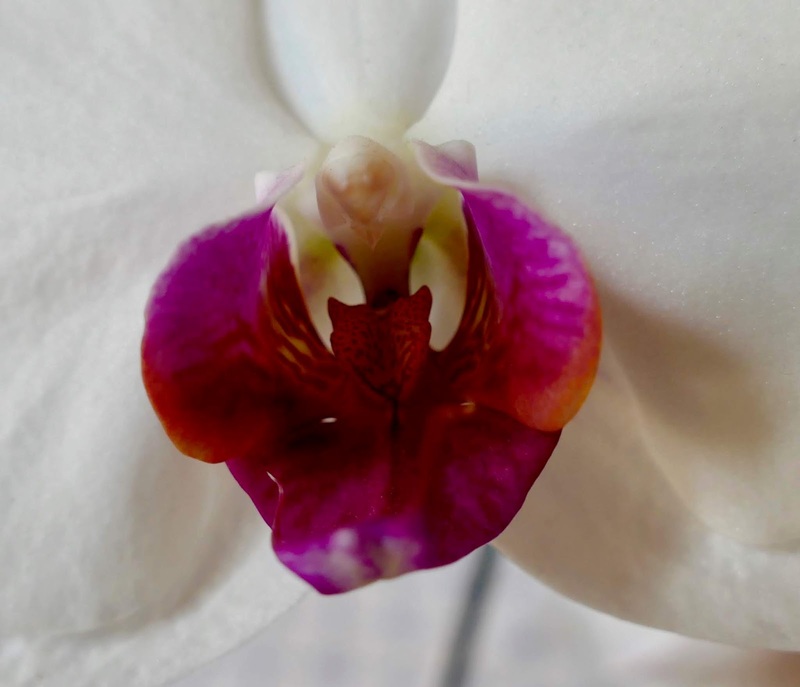 I wanted to show you the orchid that has been blooming in our garden window. Kristi got it for me a few years ago, the blooms were dyed blue, I think. Amazingly it put out a new shoot last year with pretty white orchids with pretty purple centers. It also sent out a new shoot a few months ago and these incredible flowers have lasted for weeks. Have you ever tried to grow an orchid? They really don't take a lot of special attention. The photo above I had to go around to the other side of the table to get the light ON it.. this is from the other side. Do you see the photo bomber? I love how colorful the flowers on the deck are this summer. Aren't the little Adirondack chair candle holders cute? 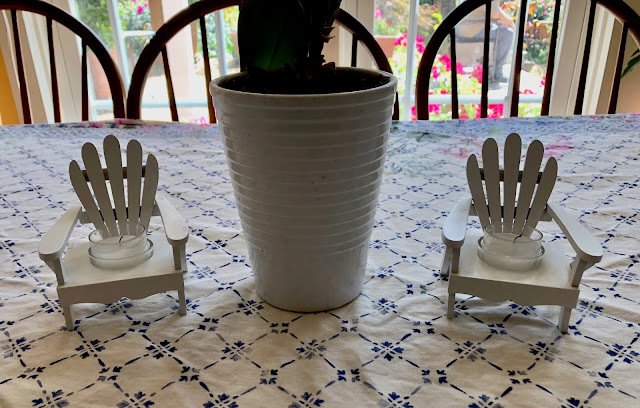 They're a surprise gift from my younger sister Denise. She's so sweet! Richard came yesterday and finished painting our old porch swing and re-hung it. YAY! 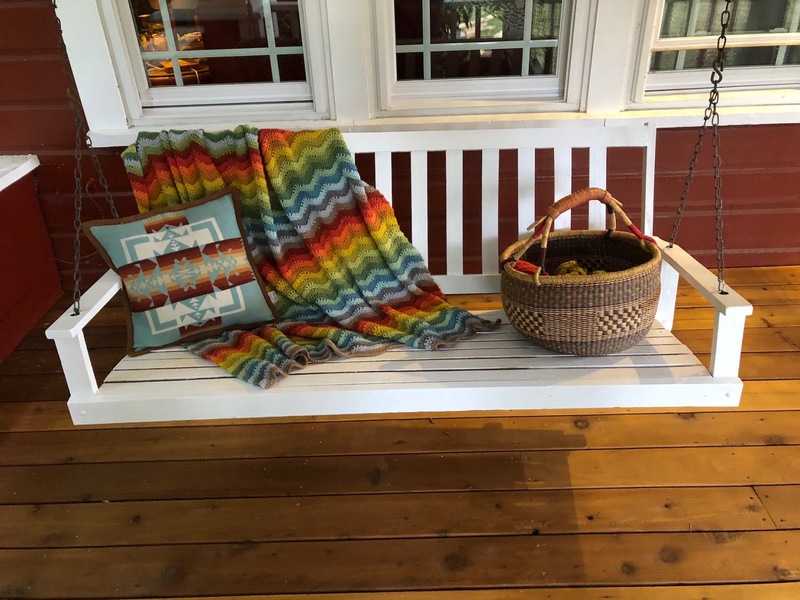 So I grabbed my Woodland Blanket designed by Lucy at Attic24 blog, my Pendleton blanket pillow and my traditional African Bolga basket full of yarn I'm using to crochet the blanket. I'm pleased with how we rescued the old porch and it's now it's a pleasant place to spend some time enjoying the countryside sounds, sights and aromas. 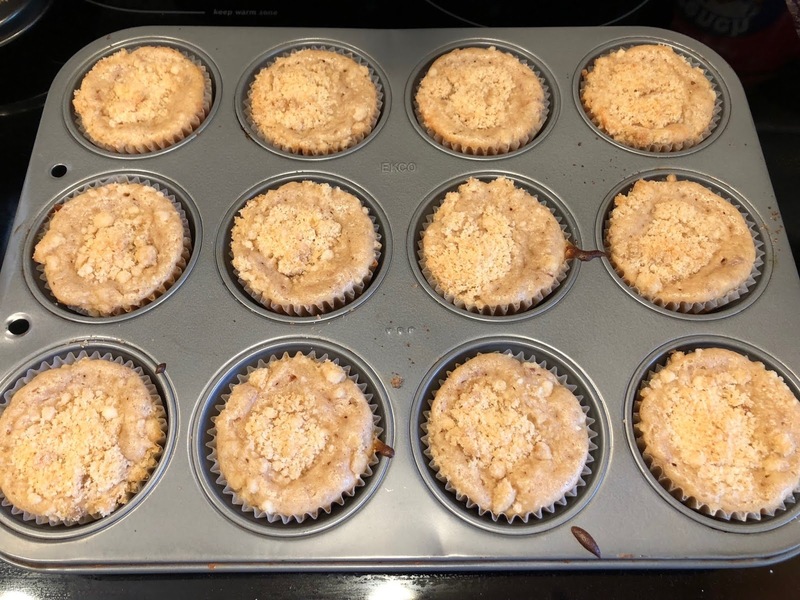 Kristi tried a new recipe, pear muffins. They're delicious, spicy, nutty and with a streusel topping. Yum! 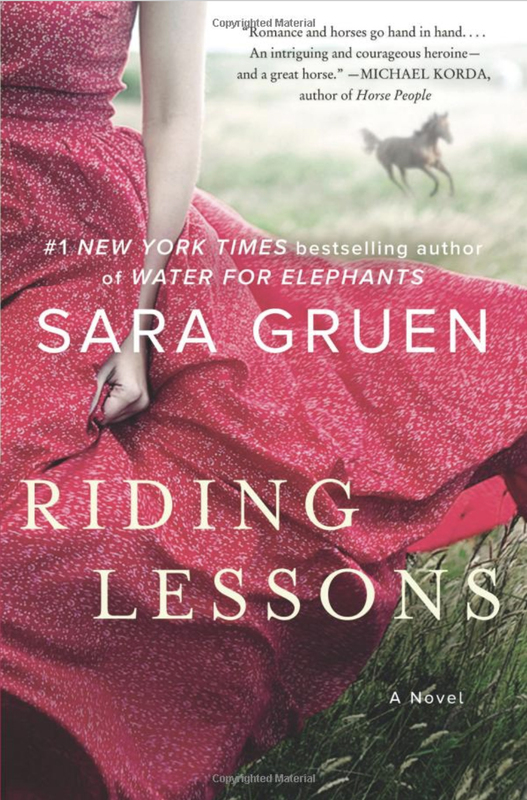 I'm on my third Sara Gruen book and am enjoying it. It really makes you understand the horse world. I'm halfway through and the heroine is going through some pretty awful things, I sure hope she gets back on track! Oh my goodness Teresa! That orchid! 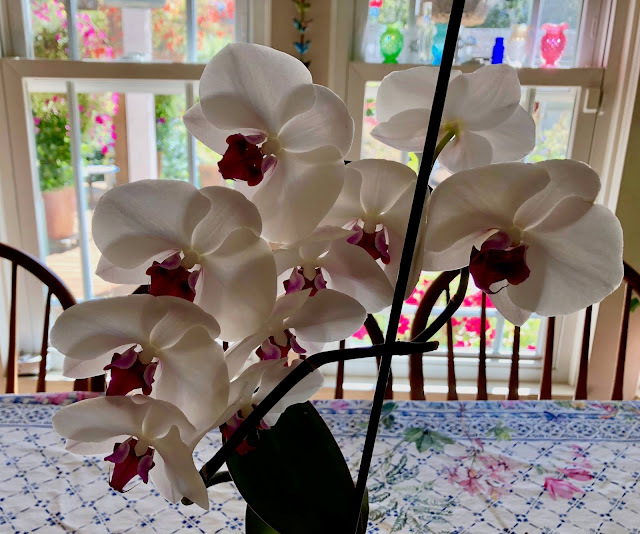 I have been given several orchids as gifts and I killed them as fast as they got in the front door. I don’t know what I do to them, but I just can’t seem to grow them. I don’t think I’ve ever seen one with that many blooms on it. Pure gorgeousness. Your porch swing turned out beautifully. I would love to come and visit and swing on your swing and knit and crochet with you. Wouldn’t that be fun? Have a lovely day my friend. 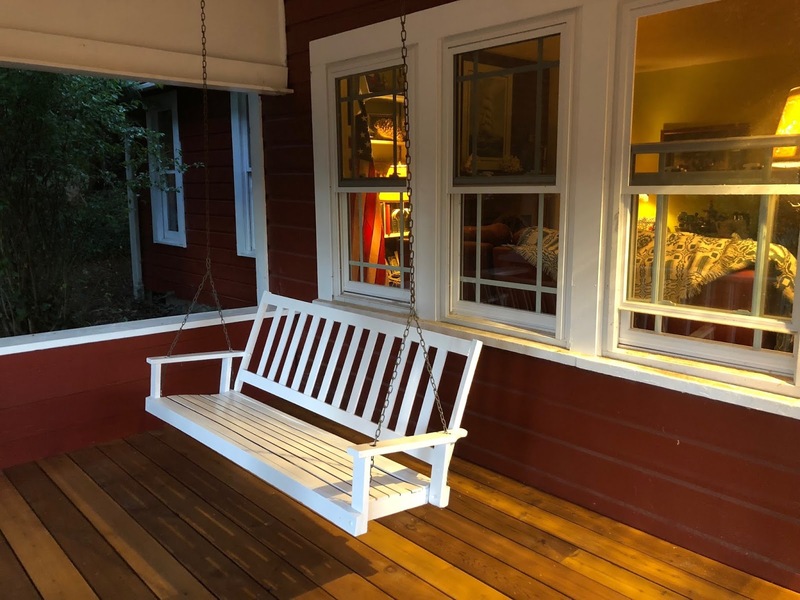 The porch looks perfect with that white swing, Teresa! I just love the red and white and the beautiful cedar floor. You styled it beautifully with your lovely pieces. Your orchid is stunning with its purple centers on the white; I have two orchids in bloom, they are easy care and keep their flowers for months. 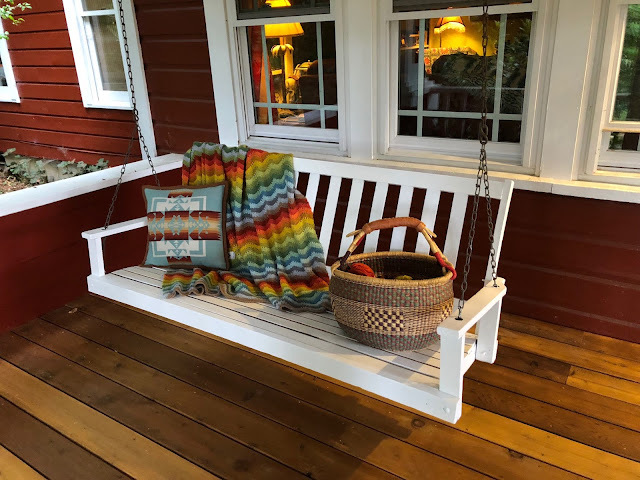 Your porch swing looks inviting with the basket and blanket. Your orchid is gorgeous! I would never have colored it blue, it seems perfect the way it is. 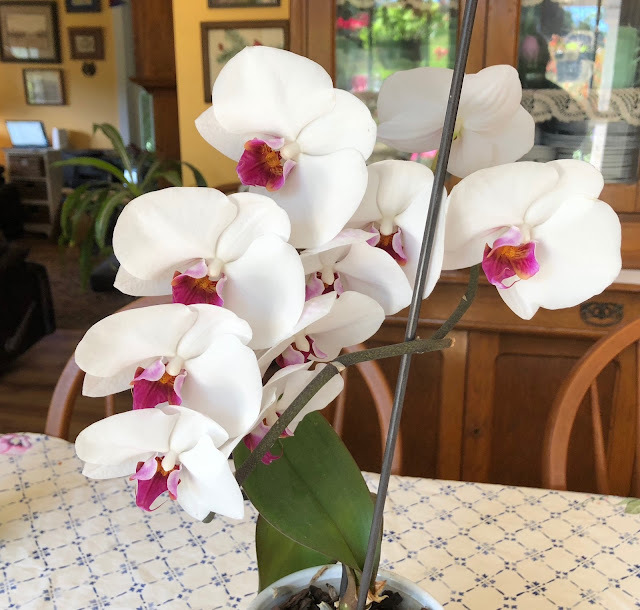 I've had a few orchids, but after a year or two they just stop blooming. Glad you decided to keep the porch swing, it looks perfect in that spot. What a lovely place to sit and knit or crochet. Do you have many bugs? Your porch looks lovely. The floor and the swing turned out really well. Enjoy! 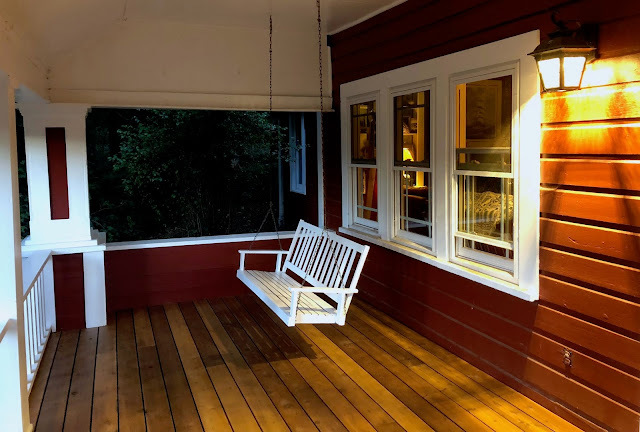 The porch is a real delight and I love how you have dressed the swing, magazine worthy. 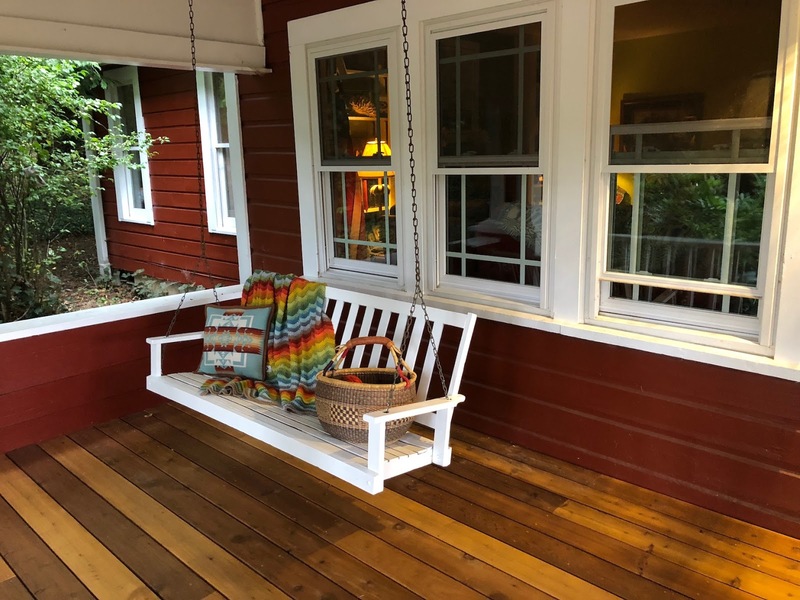 Your refinished porch looks beautiful and you decorated the swing exquisitely. 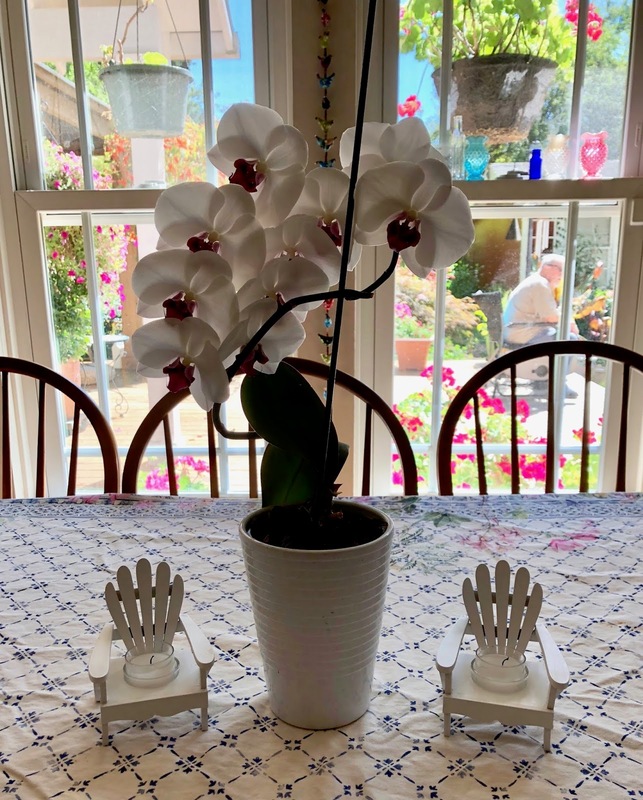 Yes .........I have done orchids. Back in Orlando I had over 75 of them. I took five of them to Jacksonville with us and they all died within a couple of weeks. I bought a super-cheap phaleonopsis when we got here and what do you know? It's doing very well. No spike yet, but it's doing so well, I think it probably WILL rebloom. The funny thing is .... that is one type of orchid I could NEVER get to stay alive when we lived in Florida.